Artpark’s opening season was back in 1974. Incidentally it was also the last time Daryl Hall and John Oates played a show at the venue when they opened for Richie Havens. Hall mentioned that show during Tuesday’s sold out performance and how it was brought to his attention earlier in the day that they had last played Artpark forty years ago. The Duo were recently inducted into the Rock and Roll Hall of Fame with the class of 2014. Tuesday’s show was a show of firsts. It marked the bands first show of their summer tour and as well as being the first concert of the Tuesday In The Park concert series at the venue. The band came out with a pair of number one smashes in “Maneater” and “Out Of Touch” before easing into “Say It Isn’t So”. The duo were backed by a six member ensemble who were competent players as they demonstrated throughout the night. Keyboardist Eliot Lewis who also has been seen on Live From Daryl’s House has had a busy week. He played a couple of solo shows one in Rochester a few days ago and one last night at The Sportsmens Tavern in Buffalo. 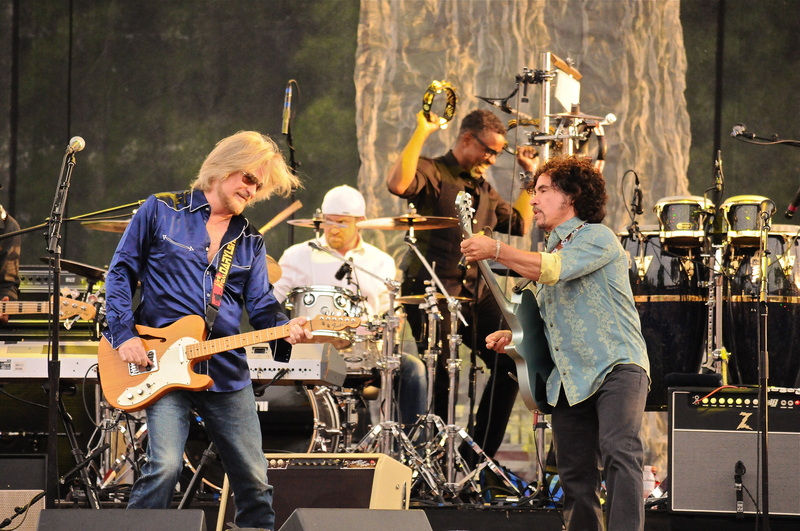 While Hall does the majority of the singing, Oates received a chance to showcase his vocals on a pair of cuts which were played simultaneously in “Alone Too Long” and “Las Vegas Turnaround”, the latter a song Hall called his favorite Oates tune. “She’s Gone” was one of the main highlights of the night as Hall said during the intro “no matter how many times they played it live it still sounded fresh”. It was also the song that got them on the charts and put them on the music map. For those that wanted to see the band jam, they got the opportunity on an overly extended “I Can’t Go For That”. The band sounded very good for their first show in a while. It also featured an extended sax solo by longtime band member Charles DeChant. DeChant first appeared on the band’s 1976 release Bigger Than Both Of Us. The band returned for an encore “Rich Girl” followed by a fantastic “You Make My Dreams”. The band left again and returned to close out with “Kiss On My List” and “Private Eyes” arguably two of their best songs from their height of popularity. It was a fantastic evening for the first Tuesday In The Park of the 2014 season. The weather was perfect, the crowd seemed cordial and the great music of Hall and Oates topped it all off by adding to the ambience. Now if only we can do something about the traffic when leaving the venue.